Bursting with endless opportunities to learn. 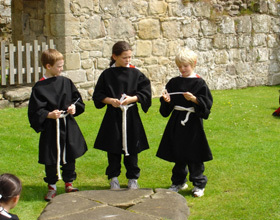 School visits at Bolton Abbey are suitable for primary and secondary students and can be adapted to suit specific curriculum requirements and age groups. Guided workshops take place mainly outside in our wonderful grounds, but also have the option of using the historic Boyle Room for some activities, and lunch in bad weather. Our school trips are accredited by the Children’s University, stamps can be given on completion of the activities. Use the following links to open teacher resource packs for self-led trips, suitable for KS1 and KS2. The teacher guidance sheets, as well as resources such as maps and photos, will be available for you to borrow on arrival. More detail will be sent upon booking. KS3 workshops are available for team building activities, and history. Amy is our Education Officer. After 8 years as a primary school teacher, she qualified as a forest school leader. Now she combines the pure enjoyment of being outdoors, with a memorable learning experience linked to the curriculum, in order to enrich and enhance work done at school.